Compliance is an issue that regularly comes up when a business is considering moving to the cloud. For some industries there are strict regulations and compliance rules that need to be kept to, and cloud computing doesn’t always fulfil the requirements. Luckily, this is changing and more cloud service providers are now recognising the issue and finding ways for companies with regulations and compliance requirements to use the cloud. For some businesses, if they have to jump through hoops to use the cloud in compliance with set rules, they won’t bother adopting the cloud. It becomes too much hassle and too slow a process to see the benefits. Of course, if they were to actually go ahead and adopt the cloud, they could start making use of the benefits and advantages that different cloud services offer, from scalability to cheap server provisioning. Data storage and security is often an area that stops or slows down the adoption of cloud computing but there are new ways to use the cloud and adhere to set rules. The hybrid cloud is one option. This allows a company to use mixed cloud services between a private and public cloud set-up. Sensitive data could be kept on the private cloud whilst applications and websites could run on the public cloud. The advantage of this solution is that a company can take advantage of public cloud benefits, such as auto-scaling to allow for extra website or application capacity but still keep the compliance sensitive data on a private cloud. With a hybrid cloud set-up, the servers can work together as if everything is hosted in the same place whilst still keeping to regulations and compliance rules. Amazon Web Services are also offering newer server provisioning types such as their Amazon EC2 Dedicated Hosts, which is a dedicated physical server that is only used by one business. One of their aims with this type of server provisioning is to address businesses with compliance requirements. Some cloud service providers are also providing documentation to help businesses adopt the cloud but with a set-up that helps meet compliance requirements. Even with the right server set-up, access control is still something that needs to be considered with compliance requirements. A business must be able to prove the levels of access that each user has and how those users and levels are controlled. In order to do this, a business needs to ask the cloud service provider if they can provide the necessary information to show the different user access levels. Security is of course an absolute priority. If you are hosting data on cloud servers, you need to ensure that it is all protected and secure and in line with compliance requirements. 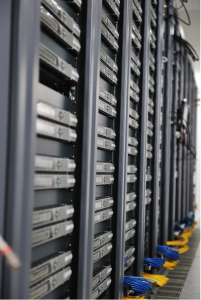 When a business provisions cloud servers, something they need to think about is data location. Depending which compliance requirements and regulations they must keep to, businesses have to consider where their data is being stored when they spin up a new server. Some companies are required to keep European customer data on servers located in Europe. This might add complications and different costs, but doing so can prevent penalties. It’s easy to see why compliance and regulation can slow the adoption of cloud computing and possibly puts some businesses off adopting the cloud altogether but with new provisioning options such as hybrid cloud and dedicated hosts, companies can use cloud servers whilst adhering to set rules!